Class 87 locos, introduced in the mid 1970s, operated the Glasgow Central to London Euston line for many years, before the Class 390 Pendolinos took over. A handful of the class saw some active use with GBRF on mail trains between Shieldmuir and Willesden before being sold and exported to Bulgaria by 2010. • 87001 "Royal Scot" at the National Railway Museum, York. • 87035 "Robert Burns" at Crewe Heritage Centre. In 2015 Electric Traction Ltd hired a number of AC electric locomotives to GB Railfreight to move empty coaching stock to and from London Euston on behalf of Serco Caledonian Sleeper Limited. Among the locos selected was 87002, which led to the loco being repainted from its BR Blue into Caledonian Sleeper "Midnight Teal". 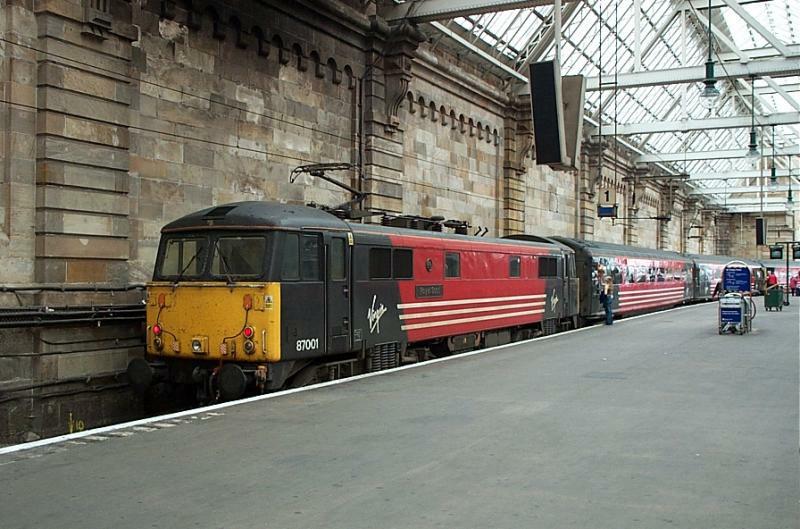 Since then the 87 has made occasional appearances in Scotland at both Glasgow Central & Edinburgh Waverley respectively, typically covering for when otherwise capable locos fail or fail to show - in some cases 87002 has covered for other AC locos and has done sleeper ECS runs to/from Polmadie and Glasgow Central. Created by SC318250 and last modified by TheDustyBinman at 04:47, 25 of February 2018.